Moreover, if these hopes and expectations are not according to the faith and hopes of these times of the various sects and denominations, it is simply because mankind have been deceived by false and ignorant teachers who in the early days of the church corrupted the way of the Lord as the antediluvian sons of God did before the flood, who walked after the vain imaginations of their own evil hearts even as it is now. The world is full of religion, but nearly empty of the true knowledge of God. There are many great revivals in which are developed a high degree of religious feeling, but unfortunately they are attended with a very low degree of scriptural knowledge and true religious intelligence. What do you make of these thoughts? Who is Levi Rightmyer? Have you heard of this book before? I’m interested in reading more from it. Let us know your thoughts in the comments below. Fascinating. I’d like to know more, too! The book is no longer available from Google Books; it appears to have been republished. However, it is available on archive.org. The book’s preface implies that the author was deceased as of 1916. My best guess is that Levi Reightman/Rightmeyer/Rightmyer was the man born in 1821 in Richmondville, New York. By 1848 he partnered with Nathaniel C. Knapp; they authored 25 or more books on penmanship, including a set of copybooks for schoolchildren that seems to have been adopted by the State of New York. None of the books appears to be online. But by 1854 Levi was publishing under his own name rather than Knapp & Rightmyer. In 1850 he was living in a hotel in the 2nd Ward of New York City and was a writing master. In 1862 he registered for the draft and was a teacher. In 1880 he was still in New York City and is listed as a publisher. He died somewhere in Ontario in 1895. He is the only man of letters by that name that I could find. Others of the same name at the same time were carpenters, stoneworkers, and odd jobsmen. So, with admittedly limited research, I’d put my money on Levi the penman. Interesting background on Levi, if correct. He seems to have come out of his own quite a bit to write a work such as this. Ok, it must be an international copyright restriction of some sort. Found this book on google books a few years ago and enjoyed reading it so much that I ordered a hard copy. I still have it and still reread it. 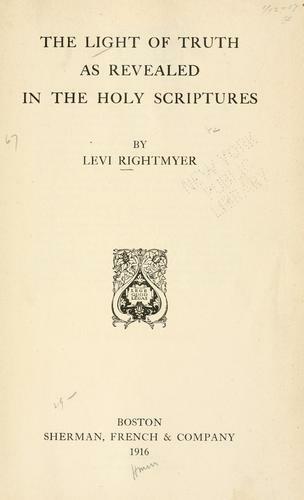 Highly recommend “The Light of Truth as Revealed in The Holy Scriptures” by Levi Rightmyer.